Washington (CNN) - The president's top intelligence adviser, Director of National Intelligence Dennis C. Blair, has announced his resignation, effective Friday. 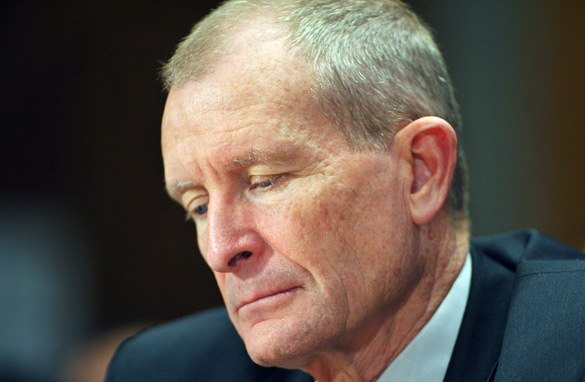 Blair, a retired four-star Navy admiral, has served in the post since January 29, 2009. His office oversees 17 federal agencies of the U.S. "intelligence community," including the CIA, the FBI and the Department of Homeland Security. Word of Blair's resignation comes just two days after the Senate Intelligence Committee released a report that sharply criticized the National Counterterrorism Center - overseen by Blair's office - for failing to properly coordinate intelligence activities to detect the botched Christmas Day airline bombing in advance. The report identified 14 "points of failure" in the incident, most of which have been raised previously by intelligence officials, including the failure of the State Department to revoke the suspect's U.S. visa, a breakdown in disseminating all information to key agencies and the failure to conduct necessary searches for information. Blair responded to the report by noting changes made in response to the Christmas incident, including creation of a National Counterterrorism Center analytical unit dedicated to following up on terrorist threat information. However, Blair's statement noted that "institutional and technological barriers remain that prevent seamless sharing of information." The issue of whether AbdulMutallab should have been read is Miranda rights also came into question. During congressional hearings on the case in January, FBI Direct Robert Mueller said AbdulMutallab was interviewed twice by what Mueller called some of the best FBI agents. Officials said the first interrogation lasted about 50 minutes, and the second was shorter. AbdulMutallab provided information that "has already proved useful in the fight against al Qaeda," Justice Department spokesman Matthew Miller said. It was after the second interrogation that AbdulMutallab was read his Miranda rights - rights under U.S. law that are read to individuals before arrest. At that point, he stopped talking to the agents. Blair, at the time, testified that a newly created high-value, detainee-interrogation group, or HIG, should have been brought into the loop. However, Blair later discovered that HIG was not yet operational, a revelation that surprised many senators. He also said he hadn't been consulted on the decision to read AbdulMutallab his Miranda rights. I wouldn't want that job either. Unrealistic expectations with extreme scrutiny make for a lot of recrimination. I think we should be working as a nation to provide these tools and keep our weaknesses contained or obscured. Resignations are nothing new in every administration, move on. A four star navy Admiral ! Swab the poop decks mate and check the starboard for arabs. Hey fellow Americans what about stripping a convicted terrorist of their U.S. citizenship? Who the hell cares about U.S. citizenship when illegal aliens have more rights and benefits than a real citizen. A sad day indeed, Maybe if we all renounced our citizenship we could get in state tuition and have some fools pander to us as future voters. The President needs to Put Brennan out next. The White House is trying to shift the blame to the government types, the agency gods. His team is horrible at keeping the country safe. another words this guy is trying to build a house without a hammer!! and that's why he wasn't fired but instead walked, what an inexcusable mess!!! this administration should be embarrassed and this is why life long democrats are jumping ship!!! They really don't know what they are doing!!! Looks like he got ran out for a new Czar to be named later. Finally someone on OBAMA's staff comes to his senses.